CLAT is one of the most talked about Law Entrance Exam. Right preparation and right guidance both are equally important to crack any exam. Behind every successful candidate, there is a right strategy. Getting cleared in CLAT Exam is not tough provided you have a right strategy. It does not matter whether you have studied English since your childhood or started at a later point in your school life. What matters is that tackling the English section of law entrance examinations will require some amount of dedicated effort on your part. Remember that in a competitive exam you are not simply striving to achieve a pass mark. You are working towards ranking higher than your peers (who run into thousands in terms of numbers)! CLAT Entrance exam consists of 5 sections, out of which Maths and English are generally considered as tough. For Maths Preparation Tips you may read the previous post. The English section in CLAT and other law entrance exams usually have three major components. These are Vocabulary, Grammar and Reading Comprehension. In CLAT, English section will be of 40 marks out of a total of 200 while in AILET 35 marks will be alloted to English section out of total 150 questions asked. CLAT English tips and tricks article will talk about tricks for preparation of the English section of the CLAT paper. I will begin with talking about the syllabus and weightage of marks allocated to the different questions and then move to tips. The total marks allocated for English in the CLAT exam are 40 marks. This includes marks allocated for reading and comprehension. In the English section, the first few questions (around 10 questions) would be based on reading comprehension wherein one would be judged on the understanding of the passage, and knowledge of meanings of words used in the paragraph. Plus, there will be about 8 questions on synonyms and antonyms, 8 questions on identifying parts of speech, and one would also be asked to identify spelling errors and give the correct spelling of words. This covers 4 more questions. You would also be asked to correct the sequence of some jumbled sentences in a way that they form a meaningful paragraph. This would cover next 4 questions. There will also be certain ( about 6 )questions on idioms. That covers your 40 questions worth 40 marks. CLAT English tips and tricks to answer questions based on reading comprehension passage is that one ought to never read the options given as the answers before one has read the passage. Some of you could follow the pattern where you read the questions before reading the paragraph and even then I strongly advise you to not read the answers first because that will just confuse you. I suggest you read the paragraph first but if not that then read only the questions first but never the answers. Reading the questions first might work really well if you have paucity of time. This helps because in this case what happens is that you read the passage from the point of view of questions. 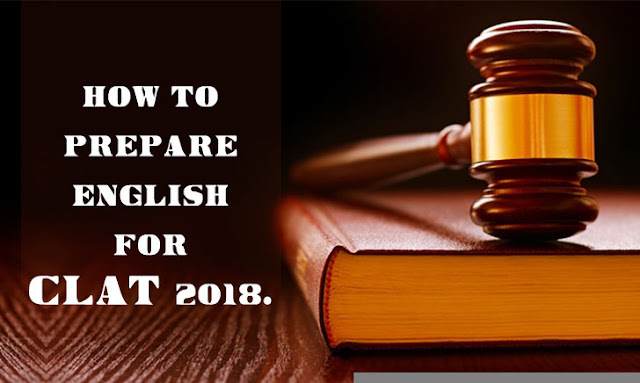 You should prepare for English while keeping in mind that this is a law entrance so you could expect legal terms too for instance chattel, intestate and more such phrases. Read Daily newspaper to work on your daily vocabs. A good question is how to improve vocabulary. You can say you have learnt a new word only when you know not only the meaning but also the usage. If you can identify the correct usage and the incorrect usage then you have learnt new words. Some of you could use flash cards with 5 words each and in that case you should make and use 20 such flash cards everyday so you end up learning 100 words daily. Learn the usage of all these words. You could appear for daily test to see how far you have progressed. You could also learn new words according to the category. Words that appear together could be learnt together. In Clat Exam 2018, Grammar questions should not bowl you over if you know the rules of punctuation and if you know what to do when a sentence does not sound right. You should know different figures of speech, common English phrases and their usage and you should know different tenses. When you want to learn the spellings of certain words what you should do is that you should write down the words and then spell them out loud. You could also try pronouncing the words as they are written to remember the spelling. When trying to prepare for idioms one should grab a list which sounds like it is not very difficult and has been heard of and yet at the same time consists of phrases that you do not know the meaning of. Choose wisely. You will find many such lists created exclusively for the purpose of CLAT. Before I end the topic I would say I cannot emphasize enough on how much reading helps. Read newspapers, read magazines and read good novels and then find out the meanings of all words that you are unaware of. My last tip is that one should practice all past year papers one can find and only after running out of all past year papers should one go for sample papers that are available online.